Does this window display do any justice for selling this store’s stock? In addition to wasting a perfectly clean glass window, clarity of the garment on display is impaired by obvious seasonal marketing. If awareness of London Fashion Week had escaped your attention, common sense had indicated that spring is certainly upon London via the unseasonal bright weather last week. My point? Window displays are meant to entice foot traffic into stores to make potential purchases. Perhaps that’s what this display was meant to do: the window was obscured, so best to walk into the store for a closer look and exit before being pounced upon by sales staff. Well; it didn’t work. In fact, annoyance overcame curiosity. There are many other examples of Jigsaw’s obscured windows around London to vouch this wasn’t a one-off affair. For starters, people window shop. It’s a thing. The shop window has to work long after the shop has closed. This one would only warrant a passing glance. Secondly, the garment is obscured. The mannequin in this example is doing no more than the dress hanging on the rack on the mannequin’s left. Thirdly, the copy: Spring Summer 15. Hmm. Sure it fills my mind with images of sunshine, outdoor activities and fun to be had. But to make me walk in to the store for a closer look? Perhaps not. So, customer journeys. Perusing a number of ecommerce sites of late, one is most assuredly encumbered many times by popups. 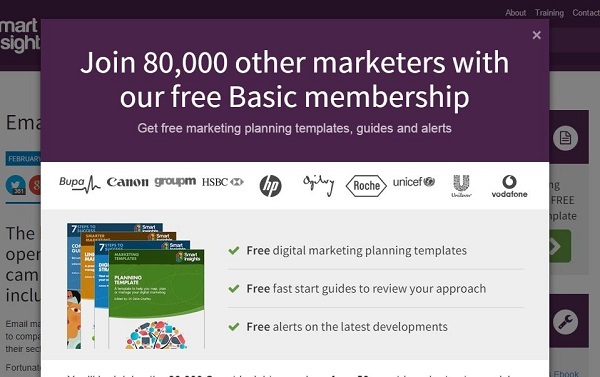 You know those interstitials that instantly appear upon loading a site’s home page, asking for newsletter sign up? 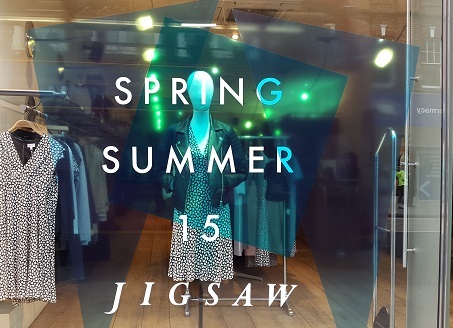 They are this Jigsaw window. They clutter, obscure, and assume potential customers will sign up before a pixel of merchandise has been consumed. Or their sizing chart has been perused. Or if their delivery channels reach Vanuatu. And why? To fill CRM systems with email addresses. 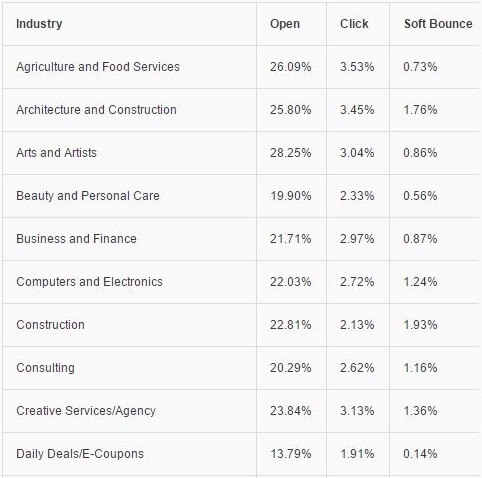 To spend yearly budgets on email marketing which the stats don’t particularly support as a valuable exercise. Perhaps a better solution is to offer sign up and sharing on each page of content. If a potential customer or user likes your content, that is the measure that will want them to engage further with your site. They will actively share the page or better yet, add the item to their shopping cart. View the full table of stats. Enlightening. What’s your email marketing strategy for 2015? 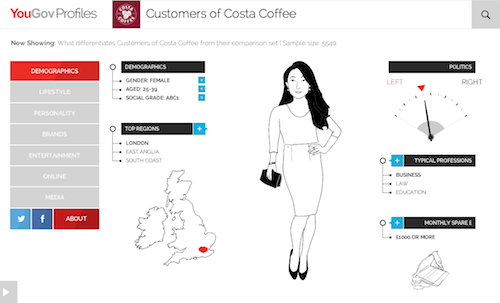 Recently, a great new data tool for marketers was released from YouGov – the YouGov Profiler. Type in any search term – anything from sport, media brands, celebrities or food to find a comprehensive profile of the market it attracts. Much hilarity ensues for search terms from Eastenders to Victoria Beckham. But looking a little closer, entrepreneurs and new business startups can find a great wealth of answers to their early questions of how to target customers with their hot new product or service. Of course, I wouldn’t suggest replacing targeted market research and customer insight with this tool. However I’ve seen personas created with a lot less ! 😦 But for those pre startup entrepreneurs who want information on their intended audiences, it’s not a bad place to start to learn about their habits. How many times must I dismiss the download Yahoo Mail app interstitial when I log in via the web? I must have closed it a hundred times already that I would have thought Yahoo’s smart tracking to pick the behaviour up by now. But no, they haven’t. I’m not old-fashioned; I just don’t see the need. I have the Gmail app and many other apps. So many in fact that I just can’t download another app to the device. So, I’m stuck with the annoying interstitial it seems. So many apps, that I wonder we must be in an app glut. A sentiment shared by Kevin Tofel who raises a question of what must be next. I believe we must be fast approaching (or are already there) a crucial time for app strategy – a similar time when web design scaled back to introduce more flat and leaner code to avoid the bandwidth block of swfs and gifs. So what’s next after apps? Perhaps the emphasis on apps will diminish along with the reliance on devices. Everyone talks about ubiqitious computing – so irrespective of device, shouldn’t we be able to we accomplish our goals on any connected technology already existing or not yet conceived? Whether it be a vending machine, ATM, kiosk or any other accessible terminals in airports, streets, in the air even. It shouldn’t have to be yet another piece of technology that we the user has to carry, wear or buy. Quite a relevant post from econsultancy this week on why retailers need more work on their multichannel offerings. Only recently on the bank holiday a friend of mine, we’ll call her Anna, had quite reluctant assistance in returning a non-functioning hair straightener – we’ll call it XYZ – to John Lewis. The whole episode emphasised a couple of design flaws but more on that later. XYZ straightener had simply just stopped working after only a handful of uses. Even after allowing it to cool down it would still fail to turn on. Anna referenced a number of online forums to discover it is a prevalent problem. Calling John Lewis (my friend bought it online from the store), she was advised it could return it in store, rather than online. Arriving at John Lewis Oxford Street, the XYZ counter was abandoned. When someone appeared, they were a XYZ representative, not John Lewis. Perfect, just the person Anna wanted. But no, the company salesperson was in store only for the day and couldn’t advise Anna what to do. ‘You can’t return it in store,’ Anna was told. ‘You need to return it to the manufacturer. You’d best find the store manager,’ Anna was told. Rewind – Anna would have to what? You’re working in retail. You should know the basic principles. Anna didn’t move and quite rightly asked the salesperson to find the store manager for her. When the store manager arrived, Anna repeated that she’s been told it could be returned in store. The store manager acquiesced and agreed JL would take care of it. Clearly the call centre and in store staff were ill advised and not aligned on return policy. At this point, XYZ salesperson finally asked to see the non-functioning straightener – something she’d failed to do before. Plugging the straightener into power, the salesperson concurred that it was indeed not working. And advised that if the straightener heats up over the stipulated 185° it will shut itself off – forever. A key piece of information not very well communicated. Even on XYZ’s product care page, it is not mentioned. Now, I’m no product designer, but doesn’t XYZ have an obligation if they are manufacturing this type of appliance to design it so that it doesn’t overheat? No, I’d just like my money back. Despite Anna and I having just visited the rather lovely roof gardens atop John Lewis, this experience left quite a tarnish on their name for us. Anna got her money back in the end, vowing to never buy XYZ again. Recently friends of mine have been active participants in fundraising events for charities. Naturally quite inspired by their endeavours I’ve wanted to sponsor or donate to their chosen causes. But two sites most recently have shown vast differences in their online models, it begs the question that their website design are huge barriers to onboarding potential donors ! This is quite topical for me at the moment as I work to simplify online registration for a global beauty retailer that severely hampers visitors becoming members. Firstly Oxfam Australia. A friend is competing in the Trailwalker hike. 100 kms. Wow, I want to support her team. I follow the link to their page where I see a clear Donate call to action. Clicking this button takes me to a form asking for my donation amount, name, email, physical address (why?) 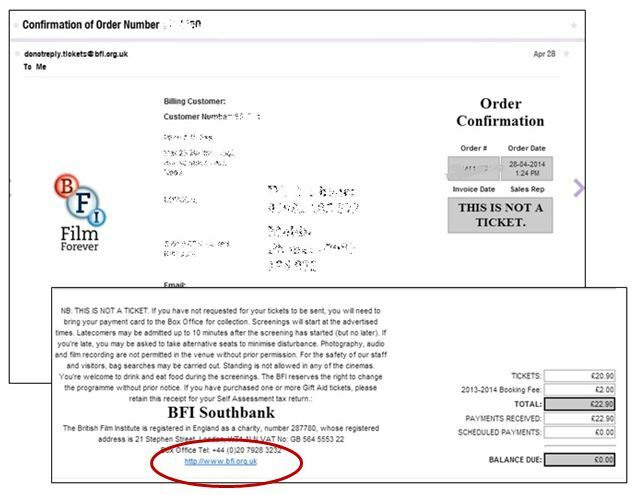 and finally credit card details with a final Confirm button at the end. Phew, all done. Yet clicking the Confirm button does nothing. The fields which I had filled are all in focus so I suspect that this is a validation exercise. So I recheck the details I entered and click Confirm again. Again, nothing. I try this a number of times, wondering if my credit card also has been charged the same number of times. What I had been failing to see was a slimline drop down at the top of the screen which was asking me to login. What? Why allow users to enter all of these details if it’s necessary to be a member? Not to mention that I’ve never been to this site before – I just want to make a donation and go. I don’t have the time to register ! My friend who’s competing is a good friend so I persevere. I register and I get my subsequent registration confirmation email. Go through the motions and I’m back on the site to login before another attempted donation. Now the site doesn’t recognise me. I retype the password I’d chosen and typed twice on the confirmation only a minute ago but to no avail. I’m getting well passed annoyed now. Every second I am re-evaluating how much of a good friend the willing 100km hike participant (just kidding, Ron !). My guilt gets me in the end and I click the Forgot password link. A temporary saviour arrives, I type it in and bingo, I’m finally recognised ! But before I try to donate again I want to check the Donation History to make sure my credit card hasn’t already been received or processed. This screen asks me to select the dates I want to check. Rather strange as a new registrant. Also the pre-populated date range seems a bit random – some date in November 2012 to June 2013. Today is 28 April 2014 right? I change the date to today and phew, no transactions display. Then I read the text above the date selector – “If you’ve made a recent donation, please note that donations may take up to five working days to appear.” Oh dear – a simple listing of donations made with a given status of ‘pending’ wouldn’t do here? So do I wait 5 days or go ahead with the donation? The other site I’ve used recently is Virgin Money Giving. What a breeze! I don’t need to register. I don’t need to login. I select the charity, the amount and chose how I want to pay. Simples. Done in less than 3 minutes. Multiply 3 minutes by the number of steps taken on Oxfam, amplified by factors of annoyance and frustration and that’s how many potential donors you’re missing out on Oxfam. Stop and question how much you really need to know about donors. If you were selling raffle tickets at the local shopping centre you wouldn’t find out much at all. It’s called fund raising for a reason, not data collection. Fundraising is hard enough – I know; my mother fundraised for charity for the best part of 20 years before the convenience of online tools. Use them wisely and be smart.